It started in perhaps the most simple way possible, a few colored pixels, than a few more, and then a few more. Eventually a world was created. It wasn’t the largest world ever created, nor was it terribly rich in lore, neither was it steeped in history. It was a land in peril however, overrun with hordes of monsters. The forces of good and the forces of evil must do battle once again, only this time, it was in a new arena, on a fledgling console known as the Nintendo Entertainment System, in the year 1989. Fast forward a mere 26 years and the now venerable Dragon Quest franchise has found its way to the next generation of home consoles yet again, this time on Sony’s PlayStation 4. Timeless, as the battles between good and evil are destined to be, their tales spanning decades, not unlike the franchise itself. Dragon Quest’s latest itineration is filled with a fair bit of nostalgia, a large heaping of monster slaying, and some questing and crafting thrown in for good measure. 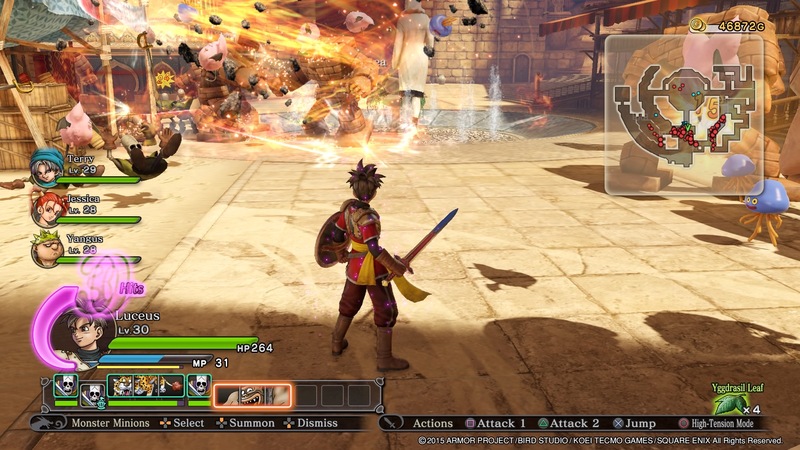 In Dragon Quest Heroes, you lead a small group of uniquely talented warriors against a seemingly endless horde of once friendly, now decidedly hostile monsters. The classic Dragon Quest gameplay is on display here in striking detail, their core rulebook has even borrowed a few pages from Koei Tecmo’s Warriors’ series, particularly the one versus a thousand style of gameplay that makes your protagonist feel like a superhero as they cleave a path through the lines with the stylized flair of a few well placed spins of a sword, cracks of a whip, or sweeping arcs of a battle staff. The old adage, “familiarity breeds contempt,” may be refuted in spectacular fashion here. From the visuals, dripping with the classic DQ style, evident in the character designs and cheerful yet whimsical monster expressions, to the soundtrack which invokes the memories of previous titles in the series, the ties to the past are numerous, while keeping an eye on the future. The seemingly random cast of protagonists are anything but, as series faithfuls will happen upon notables such as Maya, Alena and Kiryl from DQIV, Flora and Bianca from DQV, Terry from DQVI, and Jessica and Yangus from DQVIII. From a host of different worlds they find themselves together, putting their remarkable individualized talents to good use in an effort to stop the game’s chief antagonist, Velasco, and the Children of the Night. Missions involve clearing out whole areas of nasty ne’er do wells, but the primary focus of most stages emphasize the protection of a particular object or place or person from apparently endless but logically finite hordes of enemies that seep out of ominous portals akin to liquid from a sieve. In between the numerous opportunities for you to employ your skills in the protection game, there are also ample tasks to keep your band of merry men (and women) occupied. A variety of quests offer a plethora of rewards, from gold and new costumes, to rare ingredients and DQ’s rare currency exchange in the form of mini medals. Laying the figurative smack down on previous bosses is also a nice side activity as well, a standard mode exists where you can try to best some of the timed challenges, for players looking to up their game, there’s also harder modes, which rewards players with some of the best weapons in the game, should they complete it. The proverbial quest to rid the world of evil will see players set foot in many locales, such as fortified townships, desert laden cities, forested villages, and great underground halls. Many of these exotic locations can be returned to, once visited, to collect additional experience and rewards, with progressively tougher enemies showing up over time. 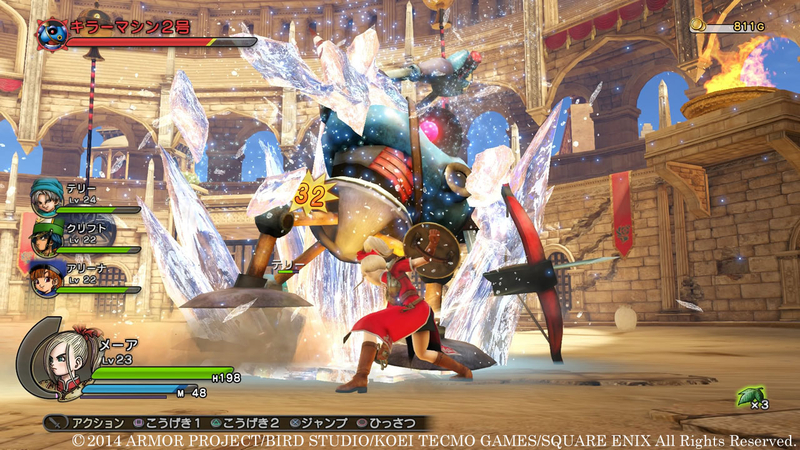 Visually, the game sports that familiar stylized look that marks a signature Dragon Quest title. Little details are ripe with whimsy and charm. Character models have that well worn “rough around the edges” feel but still manage to feel empathetic. Environments are bright and colorful and lush and the inclement weather effects, present in some outdoor areas, such as dust storms or moderate rainfall, are a nice touch. Finishing moves are appropriately flashy and over the top, often involving screen filling acts of heroism that slice through multiple waves of enemies like a sharp knife through a cake. The game isn’t without its flaws however, as with almost every Dragon Quest title out there, you’ll find yourself repeatedly grinding experience to become progressively stronger. The combat, while somewhat repetitive, makes good use of the variety of moves available to each of the different members of your party. One of the nicer aspects of the combat system is that you can build up a large string of combo hits and rather than lose that string when no other enemies are around, you can switch to another party member on the fly and continue your combo into the hundreds (or if you’re so inclined) into the thousands of hits. In the end, Dragon Quest Heroes is a game that more than meets and sometimes even exceeds the pedigree of its namesake. It’s environments are richly colorized and full of lovely details, despite the hordes of sometimes too cheerful baddies blocking your path. The combat, while repetitive, features signature and finishing moves that carve a path of both style and substance, on screen. It may not be a wholly unforgettable or original experience, but the time you spend within the realm of Dragon Quest Heroes is enjoyable, nonetheless.